We’d love your help. Let us know what’s wrong with this preview of Titanicus by Dan Abnett. Bestselling science fiction author Abnett takes his talents to a whole new level recounting an epic tale of Titans, the massive war machines of Warhammer. 20,000. To ask other readers questions about Titanicus, please sign up. A good military sci-fi tale, but not Abnett's best one. Set in the Sabbat Wars setting, the same of the author's "Gaunt's Ghosts" series, it takes the conflict on an higher and epic scale. The descriptions of the Titans battles are good, (view spoiler)[and i loved the Red Fury fighting with himself against his doom, and the sad coming back home of Cally, (hide spoiler)]but there are lots of issues in this book: it is too much long and with too many sub-plots and not well developed characters, you forget often who is who and not care at all if they are going to die or not. The final battle was sadly too short and anti-climax instead, you get just short glimpses about what is happening. Dan Abnett's "titanicus" is a great piece of military sci-fi. It focuses on the titanic battles between titan legions on the world of Orestes a half hive - half forge world. In the midst of all the carnage of the gargantuan war numerous sub-plots unfold and overlap. Although the focus usually lies on the battling titans, the story also gives a grim look into the nature of the warhammer universe and the people who inhabit it. The most notable of these tend to be during times when the imperial gu Dan Abnett's "titanicus" is a great piece of military sci-fi. It focuses on the titanic battles between titan legions on the world of Orestes a half hive - half forge world. In the midst of all the carnage of the gargantuan war numerous sub-plots unfold and overlap. Although the focus usually lies on the battling titans, the story also gives a grim look into the nature of the warhammer universe and the people who inhabit it. The most notable of these tend to be during times when the imperial guard and PDF are fighting it out on the ground. The Planetary Defense Force in particular gives a very good look into the universe as they remember their home. Túl nagy lehetett az elvárásom a regénnyel szemben – hisz már a címe is telitalálat –, száz százalékban biztos voltam abban, hogy minden tekintetben lenyűgöz majd. Sajnos nem így lett, de ez még mindig csak egy vélemény, ne higgyetek nekem, a többség nem osztja az álláspontomat. Ki-ki döntsön maga – természetesen olvasás után –, melyik véleménynek van igaza. Nekem ez összességében nem tetszett, ráfért volna egy szerkesztő, aki a felét kitörli, vagy értelmesebb tartalommal tölteti meg a szerzővel Túl nagy lehetett az elvárásom a regénnyel szemben – hisz már a címe is telitalálat –, száz százalékban biztos voltam abban, hogy minden tekintetben lenyűgöz majd. Sajnos nem így lett, de ez még mindig csak egy vélemény, ne higgyetek nekem, a többség nem osztja az álláspontomat. Ki-ki döntsön maga – természetesen olvasás után –, melyik véleménynek van igaza. Nekem ez összességében nem tetszett, ráfért volna egy szerkesztő, aki a felét kitörli, vagy értelmesebb tartalommal tölteti meg a szerzővel, de ettől még maradtam rajongó, és újra izgatottan várom a következő Warhammer 40K témájú könyvet. Captures the sense of a sci-fi war zone on a massive scale. Unlike many other Black Library books it manages to thread the needle of grimdark without wallowing in it or getting too cheesy. It was much better than I expected it to be. Usually Abnett can be a bit hit-and-miss, but this was fantastic! Well rounded and fleshed out characters, great action. Having given Gav Thorpe a go and been left wanting, I hedged all my bets on the other big name in Warhammer fiction circles, Dan Abnett. It was up to Abnett to save me after Thorpe had severely burned me. The Warhammer 40,000 universe is a universe I wanted to like. It has all the right ingredients, it just needed the right author to do it justice. Thankfully, Abnett is the man for the job. Titanicus isn't the type of Warhammer 40,000 story that would normally draw me in. I like Space Marines. (Side note: my version of Titanicus has Space Marines - I think they're Salamanders - on the cover. Not a single Space Marine appears in the 500 plus pages of Titanicus.) Titans never really appealed to me. But a mate lent me Titanicus and I thought I'd give Warhammer 40,000 fiction one last go. I now appreciate Titans much more. The story is grand, the prose is impressive, the plot is clever, and the characterisation is believable. Clichés are not completely missing, but sparse enough to forgive. Abnett can also milk his imagery; while a simile might come across as impressive on first use, recycling that exact same phrase loses its appeal the fifth time. While I really enjoyed this novel, it has a few minor flaws. The most grinding flaw for me was the number of characters. There are so many characters that I only started to really work out who was who with less than a quarter of the novel left to read. Then there is the enemy who were ambiguous to the point that I wasn't even sure at first that the Imperial/Mechanicas forces were fighting against Chaos. I like to get to know the villain of a story, know their motives. Not in Titanicus, though I'm sure that was deliberate in order to make them mysterious and more threatening. Abnett also relies on the reader's knowledge of Warhammer 40,000 background story. More than once I found myself googling Warhammer 40,000 specific terms that were not explained in the novel. Overall, Titanicus is an impressive read. Towards the end it picked up pace enough for it to become near impossible to put down (and I'm a very disciplined, one chapter a night type of reader). The plot is intriguing with impressive twists. The workings and belief systems of the Mechanicus are explored meticulously, but fluidly (not through painful exposition). I found myself really caring about the fates of the different characters by the end of the novel. The action - and this is what you read a Warhammer 40,000 novel for - is well written, though it does lack a sense of danger in places. Titanicus is definitely on my list of novels to recommend. At the moment it is number one on my list of recommended Warhammer 40,000 novels. The Black Library should thank Dan Abnett for saving me from turning my back on Warhammer novels (they should subsequently fire Gav Thorpe for nearly causing me to boycott all Warhammer fiction). I've read some bad Dan Abnett books, and I'll admit that I was a little scared picking this up; luckily, this is one of his best books, wildly entertaining and only dragged down by some bloat and pacing problems. Actually, that may be a little too kind; this book quite bloated, weighing in at 600 pages, and containing three absolutely pointless story threads (a old crazy guy watering his garden, a toymaker who, um, makes toys and nothing interesting happens to, and a dockworker who happens to be I've read some bad Dan Abnett books, and I'll admit that I was a little scared picking this up; luckily, this is one of his best books, wildly entertaining and only dragged down by some bloat and pacing problems. Actually, that may be a little too kind; this book quite bloated, weighing in at 600 pages, and containing three absolutely pointless story threads (a old crazy guy watering his garden, a toymaker who, um, makes toys and nothing interesting happens to, and a dockworker who happens to be the husband of another, slightly less pointless character). There's also one story thread that really has nothing to do with anything else in the book that could probably be dropped, all the more so as it's one of two threads about desperate PDF troopers behind enemy lines. (Also, the star of this story thread is the "slightly less pointless character" alluded to above - so if you cut this thread you might as well cut his as a bonus). Even though I poopoo on Dan a lot, this is, in my honest opinion, the best 40K novel written. Now I'm biased, I have a love of giant robots, battletech and armoured combat. SO when you give me a book that seems to accurately capture the immense scale of these monolithic machines known as Titans, but also the methodical building to building movement, tactical thinking and the best way to employ weapons designed to not only melt entire cities but also punch clean through your Titan's supposedly imp Even though I poopoo on Dan a lot, this is, in my honest opinion, the best 40K novel written. Now I'm biased, I have a love of giant robots, battletech and armoured combat. SO when you give me a book that seems to accurately capture the immense scale of these monolithic machines known as Titans, but also the methodical building to building movement, tactical thinking and the best way to employ weapons designed to not only melt entire cities but also punch clean through your Titan's supposedly impervious armour, I'm hooked. The tension in Titan battles will keep you turning pages, the back and forth between the will of the machines and the pilots mind, both fighting for dominance in a machine that only wants to rip out it's enemies throat (And what a wonderful way to portray Warhound Titans!) will keep your squirming. Amazing. There are some stories in there told from an infantryman's point of view as she tries to rescue a down Titan Pilot and some political stuff around the edges. This book feels much more like a Battletech novel than a 40K book. And if that's your Jam, you'll get a kick out of this, just like me. Titanicus is a side story to the larger saga of the Sabbat Crusade told in Dan's Gaunt's Ghosts series. We follow the story of Legio Tempestus of the Mechanicus as they defend their forge world of Orestes from a massive assault by forces loyal to the gods of Chaos. Legio Invicta is dispatched to assist, and the action, as always in Dan's work, is intense and always well done. Massive war engines known as Titans, or God machines, march into battle, and inflict apocalyptic damage on their foes. Thi Titanicus is a side story to the larger saga of the Sabbat Crusade told in Dan's Gaunt's Ghosts series. This is 40K, so this is a very complex, Byzantine story filled with backstabbing politics, heresies, schism, and of course, tragedy. I won't lie, Cally Samstag's story has to be the saddest damned thing I have read, with an utterly depressing ending. Many other characters have sad fates, or gruesome deaths. All in all, a really good read, and one you can enjoy on its own away from the Ghosts series. Kind of a ... "What if War & Peace had giant bloody mechs fighting each other in the background? and didn't have any peaceful times in it?" A sweeping saga focusing on various people throughout the entire world (though, interestingly, no focus whatsoever on the Chaos forces attacking), Abnett, as usual, makes all the blood & oil & steam feel shockingly HUMAN. He actually has an INTERESTING Mechanicus subplot (heretical, BUT TRUE, information is found & accidentally released! Or wa Kind of a ... "What if War & Peace had giant bloody mechs fighting each other in the background? and didn't have any peaceful times in it?" A sweeping saga focusing on various people throughout the entire world (though, interestingly, no focus whatsoever on the Chaos forces attacking), Abnett, as usual, makes all the blood & oil & steam feel shockingly HUMAN. He actually has an INTERESTING Mechanicus subplot (heretical, BUT TRUE, information is found & accidentally released! Or was it planned all along! Etc), and at times one wonders how he'll manage to put the genie back into the bottle. I've never been that big to the lore of Warhammer 40,000, nor its literature in general, but I always liked the bizarre techno-organic aesthetics of the techpriests, and especially the colossal semi-divine majesty of the Titans. Therefore, I went to this book expecting that I'd like it. And I did. Sometimes it's nice to be correct. That said, it's laid pretty thick on setting information and technobabble and other weird stuff that isn't really explained, probably because most readers would be expe I've never been that big to the lore of Warhammer 40,000, nor its literature in general, but I always liked the bizarre techno-organic aesthetics of the techpriests, and especially the colossal semi-divine majesty of the Titans. Therefore, I went to this book expecting that I'd like it. That said, it's laid pretty thick on setting information and technobabble and other weird stuff that isn't really explained, probably because most readers would be expected to know these things already. I didn't, though, so it was a bit of a slog sometimes: I kept having to stop to look up what all these things meant. This review has been hidden because it contains spoilers. To view it, click here. Another amazing read from the Master of Warhammer 40k lore Dan Abnett! The writer takes you on a Journey inside the machines. The Great Titans and their Princeps. The book offers a deep view of the Adeptus Mechanicus and its working cogs. I would give it 5 stars like most of Mr. Abnett's books, but for the part where some PDF troops destroy an Archenemy building. In my opinion it was written very fast and not with the usual imagination that the writer puts in his books. Also the death of Stefan Sams Another amazing read from the Master of Warhammer 40k lore Dan Abnett! Also the death of Stefan Samstag, not an important character but still very interesting, was without meaning and since it was at the end of the book it left a bitter taste. It took me a little while to become invested in the book, mainly because I didn't understand the mechanicum structure and how it operates. Several story threads are started and after they have gotten past the introduction stage I enjoyed them all. The last few chapters felt a tiny bit rushed and the endings to some of the stories were quite abrupt. I wouldn't bother reading the last page of 'poetry as I think it detracts from the stories ending. That being said, the engine figh 3 and a half stars. Started out great. An interesting exploration into a Forgeworld and the life of Ad Mech citizens. But became increasingly confusing and uncompelling as the book flitted between too many POV characters. I struggled to become attached to any of them and the story lines that I did enjoy were too short. Would have been much better to max out the major POV characters. Sure, flit between minor ones, but give us enough time to get attached to at least one or two characters. A few of the major POV charac Started out great. An interesting exploration into a Forgeworld and the life of Ad Mech citizens. But became increasingly confusing and uncompelling as the book flitted between too many POV characters. I struggled to become attached to any of them and the story lines that I did enjoy were too short. He keeps things moving along and interesting enough with some really good background info/lore around the titans and mechanicus more generally. DOES have some really cool titan on titan battles and for me this is where the book really shines! I enjoyed this. Good points are the artful shifting of scale throughout the text to create the continiously reinforced impression of SIZE. Its probably true that several of the micro-threads don't seem to lead anywhere. Perhaps they were not intended to? I am reviewing this too late to make a good impression of it. If you like the 40K universe and the towering titans, then you will love book. Several parallel stories engrossing you into the war consuming Orestes. Good development of character and wonderful portrayal of mechanicus. Only wish I would have is more back story on the organization of tempestrus and Invicta. The Story: When the vital forge world of Orestes comes under attack by a legion of Chaos Titans, the planet is forced to appeal for help. Titan Legio Invicta, although fresh from combat and in desperate need of refit and repair, responds, committing its own force of war engines to the batt Bookworm Speaks! The Story: When the vital forge world of Orestes comes under attack by a legion of Chaos Titans, the planet is forced to appeal for help. Titan Legio Invicta, although fresh from combat and in desperate need of refit and repair, responds, committing its own force of war engines to the battle. As the god-machines stride to war, the world trembles, for the devastation they unleash could destroy the very world they have pledged to save. Savage action on an apocalyptic scale and dark political intrigue meet head-on in this Warhammer 40,000 epic. The Review: Warhammer 40,000 is among the richest and most diverse settings in modern day science fiction. The almost endless amounts of factions, individuals, and groups from both friend and foe, all offer an amazing array of storytelling opportunities. Several of those factions stand out among the crowd though, the Adeptus Astartes, the Imperial Guard, and of course, the Titans. Towering, walking, engines of war. The ground shakes with every step they take. Even the various Titans become characters in their own right. They all have personalities and differences in spite of their lack of scintillating conversations. It is confirmed canon that Titans are sapient but in an erratic, unpredictable, wild way. They can’t talk, to say the least. The Titans are very much a double edged sword, which further adds to the drama. They are as much a threat to the Imperium as they are to the Imperium’s foes. The crews of the God Machines have the wrangle the violent machine spirits lest they go out of control and destroy everything in sight. Some of the most dramatic conflicts in fiction are inner conflicts and almost every story that involves the Titan God Machines involves these battles within. It is important to remember that the Adeptus Mechanicus are not scientists. They are religious order, to whom gods are machines. The Titans are the holiest machines of the Mechanicus, walking temples to the Omnissiah, (that is such a catchy term) the dichotomy between the absurdly powerful technology and the almost arcane veneration and tribal organization of such machines creates a unique picture for the reader to digest. Unfortunately it may be a little too much to digest and if does not all go down as well as it could. The author probably could have used a harsher editor. The story goes on a little too far and gets bogged down in the interesting but perhaps pointless subplots. Unlike several other Black Library tomes in his possession, Bookworm has not had much desire to revisit the battlefields of Orestes. Bookworm most likely will someday but this lack of re-readability should be indicative of this story’s idiosyncrasies. Bookworm can really only recall a handful of passages with clarity, those being the subplot of the toymaker who sells toy Titans. The aforementioned richness of the Warhammer 40k setting can at times work against itself. There are so many details that it is not difficult to get lost in all the unfamiliar terms. Exposition is a double edged sword in writing fiction and there is little to be had here. That does work in the story’s favor though, it doesn’t waste the reader’s time. It draws them in right from the get go and doesn’t let up…not for a page. That can be exciting but it goes a bit fast sometimes and becomes a bit of blur. The author of this book is often stated as being a good place to start when jumping into the grim darkness of the far future, however, this particular work of the author is not an ideal place to begin. Final Verdict: Titanicus, while perhaps not the most shining example of the Black Library or Dan Abnett, Titanicus does fall under worthy canon as being a glimpse into the most powerful weapons ever fielded by the Imperium of Man. Super hard read although enlightening about the machine side of the Imperium. Although you can get better from other resources. Excellent 40k book with a different viewpoint (Mechs) than most. Visceral titan combat. Nice look at skitarii as well. It's not all grinders after all. Titans, heresy, people who actually use technology without pouring oil all over it. What's not to love. Cobra cobra cobra. I think its 4,5 stars. I just seem few unlogical moment. But it has a great atmosphere. Titanicus is one of that books you should readin slowly and use your imagine. So Dan Abnett's Titanicus now that it has come out in soft back. So believe it or not, this book deals with a Titan war. A forge world in the Sabbott Worlds area (The same region of the Imperium that Gaunt's Ghosts takes place) has been attack by a chaos Titan legion. The Titians of Legio Invictus are rerouted against orders to defend the forge world. I am an admitted Abnett fan boy (I think he is the best Black Library author bar none! ), but I was not very happy with this book. 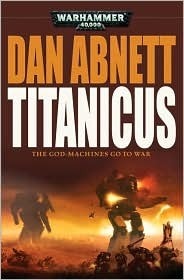 I think that Abnet So Dan Abnett's Titanicus now that it has come out in soft back. I am an admitted Abnett fan boy (I think he is the best Black Library author bar none! ), but I was not very happy with this book. I think that Abnett was reaching to far when he wrote this book. There are literally twelve plot lines going on in the book. And there are a few of those plot lines that have absolutely nothing to do with the overall story line. There are so many characters, and so many jumps within each chapter it is hard to remember, was this the tank commander guy, or the commander of the Warlord titan? I am used to authors having multiple plot lines going on and just as you get into one, it jumps to the next one, but this book takes this idea to the extreme. I found it difficult to follow. I think Abnett was, quite admirably trying to "mainstream" 40k with this book. Unfortunately, he waters down the 40k in this book so much, it doesn't feel like a 40k book. One of my largest pet-pieves at the moment with a lot of the 40k novels rears its ugly head in this novel as well. There is the "super evil" dude that is supposed to be on the "good guys" side that just F's everything up. I just don't understand why, when your protagonists are fighting the forces of evil, you need to have the clichéd super evil villain in your own camp shtick. That being said, no body does action like Abnett. The hawt Titian on Titian action is fan-friggin-tastic. There are a few non-Titian battles, and a lot of battles with the Skitarii (The Mechanicus' infantry) that are pretty awesome, but the Titian battles will blow your socks off! The book is well worth reading just for them! Imagine a collaborative effort between Quentin Tarantino and Arthur C. Clarke. Fast-paced action and gratuitous violence from cover to cover, yet remaining grounded by making the world feel real. It gives you no background on the lore or history of the world, and lets you figure out what you can as you go along. The fantasy elements have science backing them up so that it seems real enough, and it explores the damage being done to all kinds of different people as the planet gets destroyed. That’s what Dan Abnett’s Titanicus is. I’m pretty new to the Warhammer 40k world, and this is the first Black Library book that I’ve read. I loved the hell out of it. On the surface, it’s a violent story about huge robots fighting each other and destroying the world in the process, but it goes much deeper than that and shows how this apocalyptic war is affecting everyone- from the governor of the world to a senile old man who makes toys. There are a ton of characters in the book, and each one of them has a distinct arc. This sounds like it would bog down the story, but each character has a role in advancing the story so it all works out. They each have unique personalities, so you can relate to each of them differently. The characterization in this book is done so well. One such character arc ended with an interesting subversion of expectations and added a ton of emotion to the end of the book. The book puts so much power in the character’s faith that I too wanted to kneel an worship the Omnissiah and slay anyone who doesn’t. Which is good, because the religious turmoil towards the end wouldn’t have had the same impact otherwise. It could have been stronger if the Mechanicus and the Humans had more of a schism between them, because I never really felt a divide between the two parties until the turmoil had built up. In fact, I had forgotten that some of the characters were different species. Fantastic read!! I thoroughly had fun reading the book. I even liked the fact that within the book there are various plots and subplots and POV that Abnett wove together in order to give the reader a true feeling and understanding of what a war of Titans in Warhammer 40k really is. In essence, it was superb and really worth it. Even with the above praise, I do have some minor issue with the book and that is for being too short. It was too short that the characters in the book were not able to fu Fantastic read!! I thoroughly had fun reading the book. I even liked the fact that within the book there are various plots and subplots and POV that Abnett wove together in order to give the reader a true feeling and understanding of what a war of Titans in Warhammer 40k really is. In essence, it was superb and really worth it. Even with the above praise, I do have some minor issue with the book and that is for being too short. It was too short that the characters in the book were not able to fully grow to their respective peaks. For example, we will never know what happened to Tarses and his Princeps after the battle, nor will we ever know the full extent of the heresy, as well as that of Varco and Cally. In essence, the characters' growth was cut short and because of it, I ended the book feeling deprived of closure. The shortness of the book did not only affect the characters but it also affected the various plots of the book which resulted in an ending that felt rushed and a mockery to the very intricate and brilliantly crafted plot that the Author created. It felt like a film that was forced to end because the Producer and Studio said so and not because the Director wanted to. Hence, a really bad way to end a story. As such, Titanicus would have been a great book worthy of 5 stars if it was allowed to develop fully even if it will result in a trilogy or a series of books. The depiction of the Martian Mechanicum culture of machine-worship, voluntary cybernetics and the Titan Legions (Titan crews must link their minds to the machines they pilot) and the way they do battle are also very colorful and interesting. Suprisingly, some of the non-Titan characters (a lowly military volunteer with no real combat experience, a wily ambassador for the Titan Legio Invicta, others) are among the most likeable and interesting to follow through the book. When I picked up Titanicus I didn't really know what to expect. Well of course there would be titans and probably a whole bunch of techpriests running around, but at that time I had never read anything from Dan Abnett before. The story is quite good. Beside a big battle between titans there's also a whole lot of intriguing and backstabbing going on in the mechanicus as well. It feels nicely balanced. it never becomes raw, dumb action, and never too much shadow plays either. The only real problem I When I picked up Titanicus I didn't really know what to expect. Well of course there would be titans and probably a whole bunch of techpriests running around, but at that time I had never read anything from Dan Abnett before. The only real problem I have is the same as with other novels by Abnett: He writes a wonderful, awesome story and when there's just 50 pages left he goes like: "Oh, crap. I'm almost out of space! Better kill most of the characters and just hastily wrap up all the lose ends!" Dan Abnett is one of my favorite authors to read. His characters are fleshed out and brought to life in each word he writes. Titanicus is no different. This is NOT just a book about Titans, but rather one about the Mechanicus and the people of the Emporer, and their relations to each other. To anyone who's played Epic, I suggest this book. To anyone who loves the Titans in 40k, this is also a book for you. Hell, anyone who likes the Mechanicus will get a kick out of it to boot. All in all, excell Dan Abnett is one of my favorite authors to read. His characters are fleshed out and brought to life in each word he writes. Titanicus is no different. This is NOT just a book about Titans, but rather one about the Mechanicus and the people of the Emporer, and their relations to each other. To anyone who's played Epic, I suggest this book. To anyone who loves the Titans in 40k, this is also a book for you. Hell, anyone who likes the Mechanicus will get a kick out of it to boot. All in all, excellently written and enjoyable to read. That being said, things like the shop keeper who builds toy titans and the troop of 3rd reserves seem to be simply filler for the novel. They are good stories in themselves, but in the scheme of things, they don't really further the plot, and serve no other purpose. Same goes for the old man in the garden, other then showing what happens when old Titan crew 'retire'.